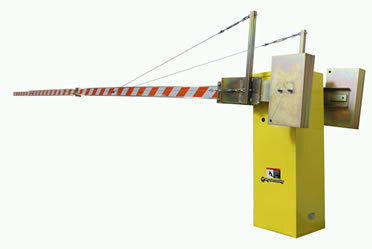 This hydraulic barrier arm operator long outlasts its competition. Applications: Industrial, government, aviation, military, corporate, commercial. Site: Ultra reliability. High cycle. Heavy arms. Wide openings. Low maintenance. Typical Sites: Port, railway, drawbridge, petrochemical, corporate campus, airport runway, traffic control. aluminum, fiberglass side or yoke mount arms. All voltages / phases. Continuous duty. other specialized, multiple operator applications. Options: HY-5A intelligent vehicle detectors. UPS battery backup. Custom colors. Compatible with all available access control, safety, vehicle detection and many other accessories. StrongArm 20 UPS – HTG 320-3 .